A day after receiving the inquiry report that a traffic marshal leaked information about drunken driving nakas on WhatsApp, the UT traffic police has recommended dismissal of the traffic marshal. Travelling on the four-lane Panchkula-Kalka stretch of the busy Ambala-Kalka National Highway No. 22 will become cheaper in the coming days. The state government has mooted a policy for giving relaxation to commuters in the toll charges. A major demolition drive in five colonies, scheduled for this week, has been postponed, thanks to a last-minute reality check by UT officials regarding the status of the land that has been encroached upon. The token system, which was proposed to be introduced at the PGI OPDs from May this year, is set to be delayed further as the procurement process has not been completed as yet. With just two students making it to the provisional merit list of the Punjab School Education Board (PSEB) in the Class X examinations, Mohali district, known as the education and IT hub of Punjab, has once again attracted criticism from all corners, including state Education Minister Sikandar Singh Maluka. 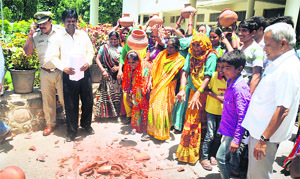 Breaking all security barriers, nearly 50 women carrying pitchers barged into the Deputy Commissioner’s office complex and held a protest in front of his office, demanding regular water supply in their colonies. 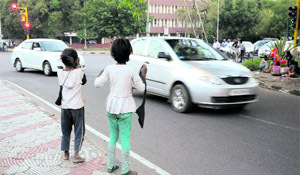 The Chandigarh Commission for Protection of Child Rights is launching a special drive to shift child beggars to destitute homes in the city. With the financial powers of the Finance and Contract Committee (F&CC) increased from Rs 35 lakh to Rs 50 lakh, the Municipal Corporation (MC) is now planning to increase the financial powers of its other committees. Owing to the vacant post of Superintending Engineer, Building and Roads (B&R) in the Municipal Corporation here, the executive engineers (XENs) in the department have been asked to get the estimates for various works and tenders checked and countersigned by another XEN so as to prevent errors. Elections for the posts of chairman and vice-chairman of three sub-committees of the Municipal Corporation (MC), namely Road Committee, Water Supply and Sewerage Disposal Committee and House Tax Assessment Committee, will be held on June 11. The Chandigarh-based Global Human Rights Council today alleged that the managing director (MD) of the Chandigarh Industrial and Tourism Corporation (CITCO), Tanvi Garg, who is a 2009-batch UT cadre officer, was misusing an official vehicle of the corporation for her private visits to Delhi and Mussoorie. A day after courting a controversy by allowing a liquor vend to operate from a tin shed on the outskirts of Kajheri village, the Excise and Taxation Department today sealed the vend. PGI neurologist Dr Dheeraj Khurana, Additional Professor and Coordinator, PGI stroke programme, has been awarded the Practising Physician Quality Award-2014 by the American Academy of Neurology. A hidden Global Positioning System (GPS) installed in an SUV, which was stolen from Sector 28 here on May 29, helped the UT police trace it. Encroachments by residents in Phase XI here are turning out to be a major hurdle in the way of maintaining the underground water supply lines in the area. Recovery of an antelope-antler from the house of the accused in the Ashutosh Bhardwaj murder case, in Manav Colony, Saketri village, on Saturday, has raised a question mark about the involvement of the family in poaching of wild animals. 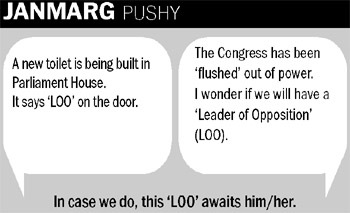 Residents of Kharag Mangoli village demanded to shift a newly opened liquor vend from the vicinity of village. A delegation of the villagers, including women, raised the demand in ‘Khula Darbar’, conducted by Panchkula MLA, DK Bansal, in Sector 26, on Sunday. 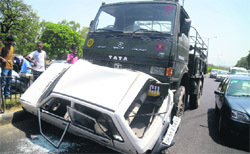 A Panchkula-based expert in manufacturing road safety products has written to the district administration and the officials of the National Highways Authority of India (NHAI) on the frequent accidents occurring at the intersection of the Kalka-Ambala and the Panchkula-Yamunanagar highways at Majri Chowk. Surinder Kaur, a 75-year-old woman, had a narrow escape after an Army Canter hit her car at the Housing Board light point today. The fish seed farm of the UT Fisheries Department, near Kishangarh village, has fallen on bad days. Once a favourite destination for ornamental fish lovers, the fish breeding centre is crying for attention. After cherishing the wettest and coolest May of the decade this year, city residents will have to brave hotter days with no possibility of rain in the next one week. 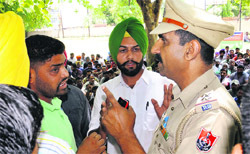 A protest staged by students at Panjab University — against the exclusion of Punjabi and Hindi language in a few entrance tests — took an ugly turn today when they entered into a scuffle with the security personnel on the campus. 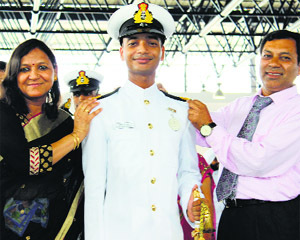 City lad Rohit Manderwal (23), has made the city proud by bagging the Best Cadet Award at the Indian Naval Academy (INA), in Ezhimala, Kerala. Though Rohit had been selected to pursue Phd from Cardiff University, he opted for a career in the defence forces. Rohit Manderwal in a jubilant mood during the passing-out parade at the Indian Naval Academy in Ezhimala, Kerala. Goswami Ganesh Dutta Sanatan Dharma College (GGDSD), Sector 32, released the prospectus for various courses for the academic session 2014-15. 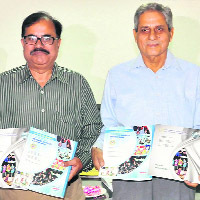 President of the GGDSD College Society, Upkar Krishan Sharma, along with other college officials released the prospectus today. Students of Ryan International School visited Jeevan Mukt Nishulk Vidyalaya, Nayagaon, as part of a project sanctioned by The Energy and Resources Institute. 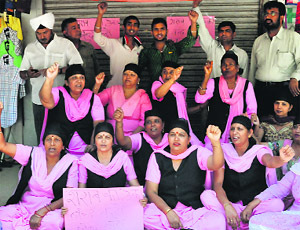 The teachers of aided colleges in Punjab will hold a protest dharna in front of the office of DPI (colleges), Punjab, in Mohali on June 6. As many as 35 students of Patiala, including 26 girls and nine boys, have made it to the merit list released by the Punjab School Education Board in Class X, the results of which were declared today. Registration of outdoor patients at the local community health centre (CHC) has gone up by over 100 per cent in the past one year. Punjab is the third worst-affected state in terms of drug addiction wherein the menace has overburdened medical and social systems. This was claimed by experts during the inaugural of a drug de-addiction and rehabilitation centre, “mur-vaseva”, here today. The center has been set up by the Gian Sagar Medical College and Hospital in collaboration with the Punjab Police. A man was killed and another sustained serious injuries after an unidentified tractor-trailer hit their scooter near Jawaharpur village on the Ambala-Kalka highway, this morning. 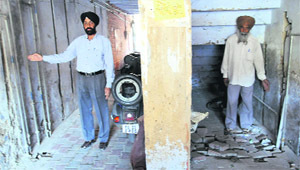 The Crime Branch of the UT police today arrested a burglar, who was involved in thefts at Chandigarh and Panchkula. Seven cases of theft were solved with his arrest. The police had ruled out the possibility of honour killing in the Saketri teenager suicide case. Assistant commissioner of Police, Mamta Sauda said samples were sent for forensic and chemical examinations to ascertain the exact cause of the death. 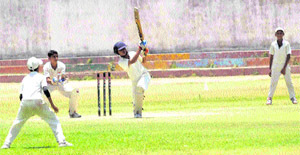 Even brilliant bowling figures by Mannu Sharma (7 wickets for 23 runs) failed to encourage the Chandigarh Cricket Association (CCA), affiliated to the Punjab Cricket Association, to claim win against the DAV Cricket Academy during a match of the CCA Cricket Cup for Boys (U-12), being held on the DAV School cricket grounds here today. Nine-year-old golfer Hunar Mittal, a student of Strawberry Fields World School, Sector 26, here, finished 6th in the European Golf Championship at Longniddry Golf Course in Scotland. The three-day tournament was played on fast-greens under rainy climate with heavy winds making it more difficult for golfers to mark their day. Cricket teams of Chandigarh, Patiala and Amritsar registered win in their respective matches during the Punjab State Inter-district Cricket Tournament for Boys (U-19) for Dhruv Pandove Trophy held today. The Himachal Cricket Club scored 275 runs on the first day during the three-day 1st Usha Bhardwaj Memorial Cricket Cup for Boys (U-16), being played at the cricket grounds in Sector 56, here, today. Bringing laurels to the City Beautiful, 19-year-old local shooter Vishwajeet Singh contributed to the team’s achievement in winning a silver medal during the 1st ISSF Junior Shooting World Championship held in Germany from May 26 to 31. 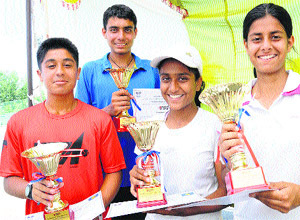 Digvijay Partap Singh of the Chandigarh Lawn Tennis Association (CLTA) and top seed Seerat Kaur Pannu won the finals of boys’ and girls’ categories, respectively, on the concluding day of the Tennis for Excellence Academy-AITA Talent Series for boys and girls (U-18) tennis championship, held at Sunny Enclave in Kharar today.